On Saturday December 5th 2009 we were at the Mayernik Center which is located inside the Avonworth Community Park in Pittsburgh Pennsylvania. 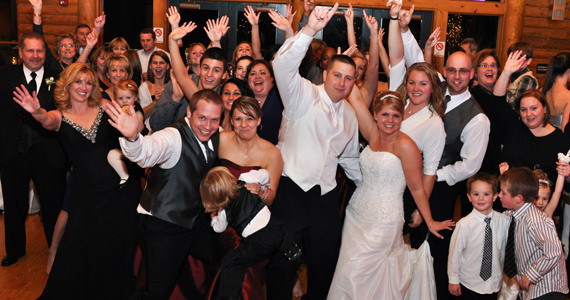 The event was a wedding ceremony and wedding reception for Ryan and Amy Jakubek. This was the second wedding that I have worked at for this family. I was the disc jockey for Amy’s brother Eric Osterman and Jennifer Eichner, when they were married back in April of 2005. We started playing prelude music at 3:00 pm as guest began arriving at the Mayernik Center. The wedding ceremony started at 3:30 pm and was presided over by Reverend Patrick O’Leary. The ceremony lasted 25 minutes, after which guests enjoyed cocktails and appetizers. During this time, the bridal party posed for photographs with photographer Tracy Brien of Tracy Brien Photography. Although it was a little chilly on Saturday, the bridal party toughed it out and got some great pictures outside by the wooden bridge & the playground at the Mayernik Center. Shortly after 5:00 pm we formally introduced the bridal party to “I Gotta Feeling” by Black Eyed Peas. After the introductions, Ryan and Amy played The Newlywed Game prior to cutting their wedding cake. For the cake cutting, they chose the song “I Wanna Grow Old With You” by Adam Sandler. The best man Brandon Gobel then toasted the bride & groom prior to dinner. 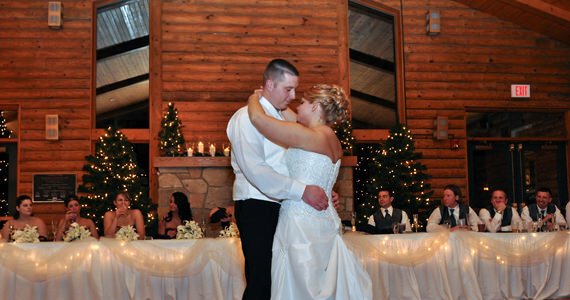 After dinner Amy and Ryan shared in their first dance together as husband and wife to “Then” by Brad Paisley. They then danced with the bridal party to “That’s What Friends Are For” by Dionne Warwick. Next, Amy requested a special dance with her father Mr. Robert Osterman to “My Wish” by Rascal Flatts and Ryan danced with his mother Mrs. Linda Peretich to “You’ll Be In My Heart” by Phil Collins. 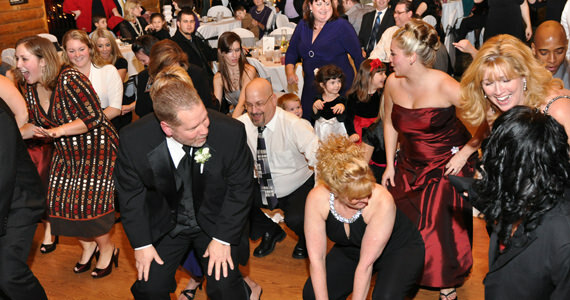 Through out the remainder of the evening, guests danced to music by Pitbull, Def Leppard, The Clarks, Journey and more. At 10:00 pm we invited all of the guests to share in the last dance of the evening to “I Could Not Ask For More” by Sara Evans. We would like to wish Amy & Ryan the best of luck and we look forward to seeing them again on August 28th 2010, when we will be the DJ for Tiffany Craine’s wedding reception. Tiffany Craine was Amy’s maid of honor and is planning her wedding reception for next August at The Willow Room in Belle Vernon Pennsylvania.